The " Lungoviaggio" project was born from the meeting of the duo Pastis of the brothers Marco and Saverio Lanza, active for a long time in video art, with Irene Grandi, who with this first work inaugurates the celebrations for his 25-year career. The Visual-Album is the innovative artistic format that Marco, Saverio and Irene have materialized for this happy marriage between video art and song, proposing in its track list twelve video-musical works of which they sign together texts, music and images. Twelve videocamps (not to be confused with the classic video clips) that arise from moments of everyday reality, from news, from history or from an occasion. The numerous guests, portrayed while expressing an unconscious internal musicality, become interpreters, like Irene and the Pastis, of this double reading musical work, which can be seen but only heard. 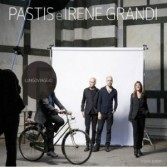 As the title itself testifies, "Il Viaggio" is the concept of the visual album. A theme that has always been very dear to Irene, who well symbolizes her twenty-five years in music, present in many of her albums (just think of the famous single "Before leaving for a long journey"). Equally for the Pastis, because it has always been a constituent of their poetics that opens a window on the world full of amazement, emotion and sense of humor, which denotes an authentic sympathy for humanity and the lightness of those who can scrutinize out of pure curiosity. The lineup of the visual album makes use of prestigious collaborations of unique characters in their field, for each of which the trip has in various ways distinguished their career: we refer to video-works such as "Welcome on your journey" where it intervenes in a singular way and inimitable Vasco Rossi; but also "I would like to take you on a journey" that sees the presence of the astronaut Samantha Cristoforetti of ESA (European Space Agency); as well as for "Tutto è uno" videocanzone in which the writer Tiziano Terzani appears posthumously, whose life coincides with the journey; to finish with "I viaggi per mare" opera sung with Cristina Donà, an author who has never covered the same route in her travels in music.